For all those media hype and publicity by Aamir, Ghajini does not disappoint for most part. A perfectionist he is and the Khan lives upto it - a tonsured head, a eight-pack body and a matching act. On the whole, film stands out for amazing performances by the lead actors, Aamir Khan and Asin, the southern sensation. Sanjay Singhania(Aamir Khan), CEO of Airvoice, is suffering from a mental disorder, where in he remembers about anything for only 15 minutes. And, why he is in such a state is a different story altogether. To manage with his inability, he makes notes about everything he encounters daily, takes photographs of whoever he is in touch everyday and also, he is on mission to find his enemy Ghajini and kill him. Kalpana(Asin), his love is dead and needless to say that Ghajini is responsible for that. How Sanjay accomplishes his mission is rest of the story. 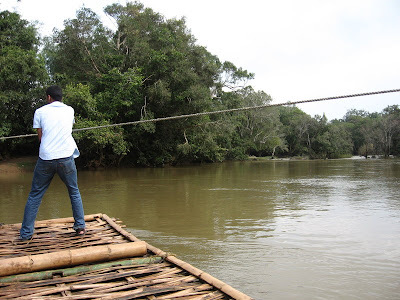 Jia Khan, a MBBS student helps Sanjay on his way. What's Good: Aamir excels in his potrayal as always and that is the precise reason why he takes up only one movie every year. His body language perfectly suits the role. Asin, as a cheerful youngster impresses everybody. More than Aamir, it is Asin who steals the show with her stellar performance. Well, worth watch for Aamir fans and also for who want out-of-the-mill film stories. A R Rehman at his best in songs - Tu Meri Adhuri Pyaas Pyaas, Behka Behka. Exotic locations for song sequence are treat to watch. Also, hats off to the camera work too! What's Not So Good: Asin's introductory song in the movie looks as if it has been stuffed into the movie sequence! Film could have been done without the song and Asin histrionics. Also, climax is a slight disappointment as the much dragged climax may remind you of the 80s film era! This and That: Following was the SMS I received yesterday about Ghajini :- Describe Aamir Khan in GHAJINI - A man without hard disk, only cache memory and high speed processor! Of course, this message was forwarded by a software engineer. 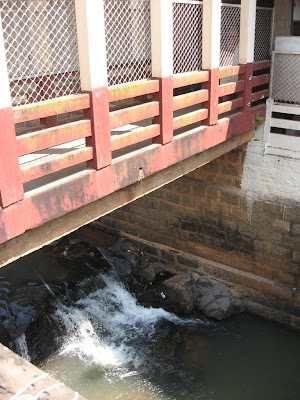 Two stories based on favorite subject of Kannada producers, underworld! Almost the same team. But the second one fails to live up to the expectations. I am talking of Agni Shridhar's latest venture, Slum Baala. His earlier film Aa Dinagalu was a hit and was among the 10 best Indian movies in 2007 according The Week, well known English weekly. That was the precise reason why me and my friend, Raghav had no hesitation to go for the movie. But here, the film let us down with its weak plot. On the brighter aspects of the movie, Duniya Vijay, Umaashri, Shubha Poonja and Shashi Kumar, Achyuth Rao(more known for his role in hugely popular serial in E-tv Kannada, Moodala Mane) give commendable performances. M N Suresh, another TV artist, though does a good job, overacts in some scenes. Quite many films have come on the subject of underworld with same old story of nexus of police and politicians taking the help of underworld dons to achieve their motives and in the end, eliminating them, when they get any slightest hint of dons rebelling. Well, story is familiar here too. Vinayaka Baala alias Slum Baala is a little known rowdy who gets deported to Mumbai for a year. Baala joins his friend Razaak there. 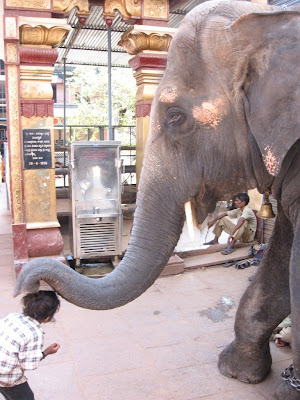 He also gets to meet his love, Shubha Poonja. 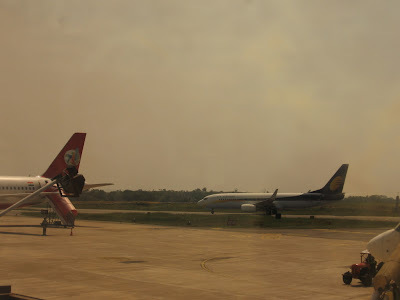 Circumstances force Shashi Kumar, a police officer, who had earlier deported Baala, to call him back to Bangalore. M N Suresh, playing a politician takes the help of Baala to eliminate his adversaries. In the end, Baala is about to rebel against Suresh, as Baala does not get the deals done as promised. But then Baala is killed in an encounter planned by Shashi Kumar, the police officer. Camera work in the film is good and there is one scene which stands apart - the scene where Baala kisses the pistol and says bellagaagbekuntha naanu yaavaththu fair and lovely haakdavnalla; naanu kariya, neenu kariya, saath kodtheeya. (Loose translation in English may go like this - I had never used face creams to look fair; I am black and you (pistol) too are black, will you stand by me). First half of the film is entertaining but the second half is boring. Yes, boring as second half is all about showing two warring parties, Baala and his gang on one side and Suresh and his group on the other side, discussing strategies, how to eliminate one another in alternate scenes. Amidst all these, two melodious songs - Ale Aleyu Haadidavu, Manasu Rangaagide Indu steal the show. This is probably the only similarity with Aa DinagaLu, as songs - Aa Dingalu and Sihi Gaali won the audience's applauses, a year ago. Mast Maja Maadi - film as a whole, does not impress much. But the dialogues for most part of the film, sets a laugh riot in the movie hall! Also, the performance of Komal which hides below par performance from lead actors! But who cares, as you have to just concentrate on the dialogues. Mere presence of Komal adds comedy element to the scenes. Its been long time since he has come out of the shadow of his elder brother, Jaggesh. Film posters project Sudeep as the hero of the film but heroic performance if any ends there, as he delivers an indifferent performance here. Film is about 4 jobless guys - Diganth, Komal, Vijay Raghavendra and Nagakiran, who are after the Rs.20 crore bounty, hidden under a big 'M' in Ooty Botanical Garderns. Things get complicated as they are joined by Sudeep, a disgruntled police officer who knows this secret and trys to stop at their mission and take away the full share! Further Sathya Raj, playing robber and Rangaayana Raghu also join the mad race. Comedy of errors to induce laughter is common in such tales and here too. Though the gang of these funny guys get hold of the treasure, they donate it to charity under changed circumstances. Sole heroine in the movie, Jenifer Kotwal gives an average performance. Lip synch for dubbing seems out of place. But it also a pity that for most of the Kannada heroines, the only dubbing artist is Deepu. Let the heroine be - Pooja Gandhi, Ramya aka Divya Spandana or Shubha Poonja, the female voice is of Deepu only. 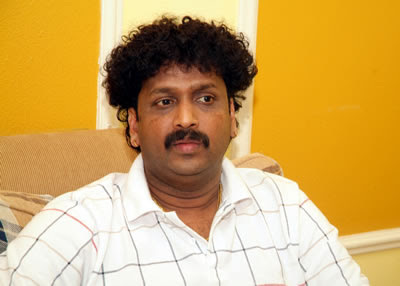 Rangayana Raghu seems like a slapping expert in the movie with acting going backstage. Nagakiran, who plays a dumb guy in this movie, has been dubbed with voice similar to that of duck for his antics - this could have been clearly avoided. Diganth has to go back to his acting classes. Tennis Krishna, Sihikahi Chandru, Umashri come and go. 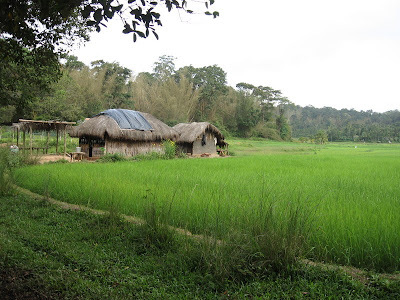 Of the movie locations, I could identify Manchinabele backwaters, on the outskirts of Bangalore city, where much of the scenes are shot. Surprise package is the song in the climax featuring Kannada superstar Upendra and a galaxy of Sandalwood heroines - Andrita Ray, Sharmila Maandre, Nethanya, Suman Ranganath, Keerthi Chawla, Rekha, Sanjanaa, Ragini, Ramanitho Chowdhry, Gowri Munjaal and Maahi. In the end, as you would have thought by now, Mast Maja Maadi is a remake of Dhamaal which in itself is a remake of hollywood flick Its a mad, mad, mad world!. I would like to call these two remakes as national remake and international remake! That's not all - some scenes for Mast Maja Maadi are blatantly lifted from Golmaal, making it sort of kichdi. So, initially when the film begins dialogues seem direct translation of Hindi version. But for the audience's respite, this translation saga ends at first few scenes. An average film, can be given a try or better, a miss! 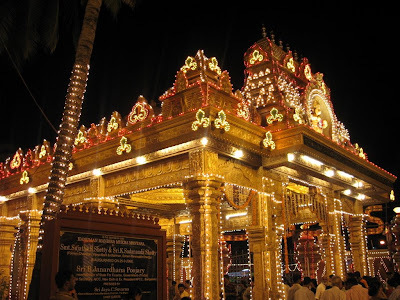 Mangalore Dasara celebrations at Kudroli Gokarnanatheshwara Temple is one of the biggest festivities in coastal Karnataka. 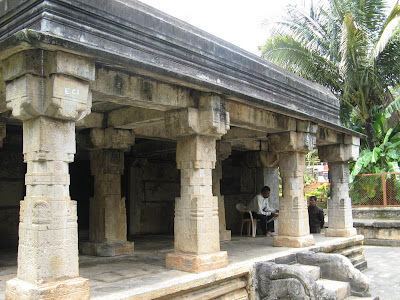 Kudroli Gokarnanatheshwara Temple was established as a small shrine by Sri Narayana Guru in 1912. Sri Narayana Guru, hailing from Kerala worked for the upliftment of backward communities. 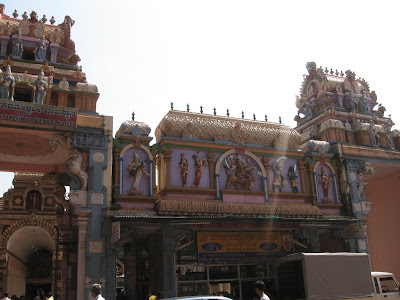 Dasara celebrations here began 18 years ago in 1990, when the old small shrine was renovated into a large complex in Chola style architecture. 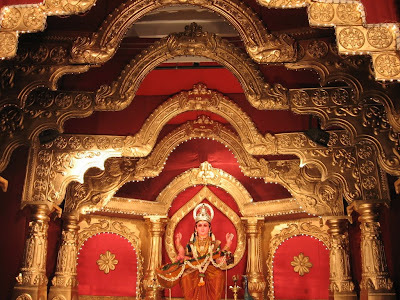 In 1995, tableaux were introduced for the first time in the Dasara procession on the last day of celebrations. Mangalore dasara is called common man's dasara as it is not funded by the Government as in Mysore Dasara and people of the city participate actively. 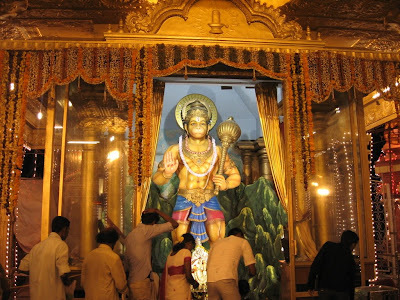 All roads in Mangalore lead to this temple during Dasara. 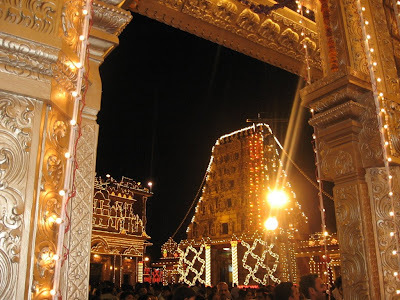 This year, Dasara/Navarathri celebrations were held from 30th September to 9th October, last day being Vijayadashami. 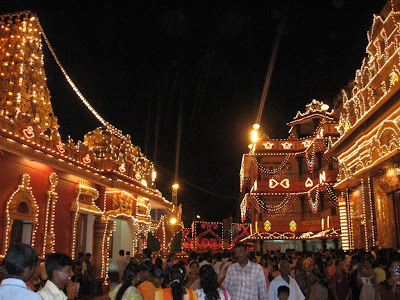 I was in Mangalore during this time and got a chance to view the festivites after several years. 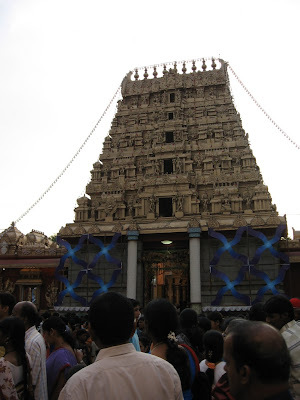 The temple complex is largest in Mangalore city and wears a modern look. When I went to the temple in the evening of 8th October, the shrine was full with people and the temple fully decorated with electric lamps/bulbs wore festive look. Temple painted in gold color added to the visual treat. Main attraction during the festivities was the hall where the idols of Navadurgis are kept. Nine divine forms of Goddess Durga namely Shailaputri, Brahmacharini, Chandraghanta, Kushmanda, Skandamata, Katyayini, Kalaratri, Mahagouri, and Siddidatri are called Navadurgis. 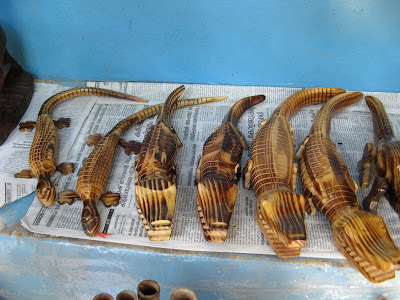 Along with these, idols of Goddess Saraswathi and Lord Ganesha are also kept. This hall was decorated like a palace. 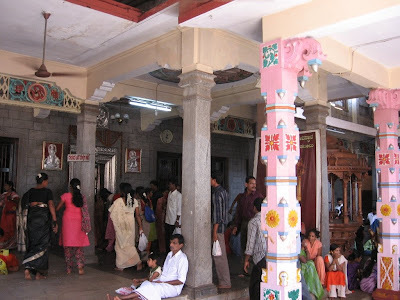 Evening was the ideal time for people to visit the temple along with their families. Long queues to go to the temple hall was as expected. After seeing the idols people used to capture the photos with their mobiles, cameras. Volunteers had a tough time asking the people to move on once they had the darshana. Another attraction of the place was the temple pond where huge fountains are installed. 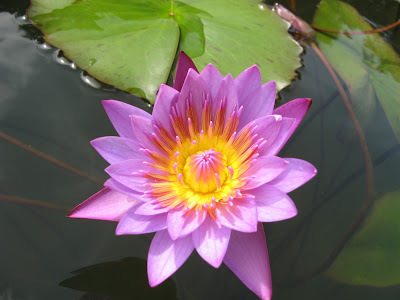 At each of the four corners of the pond, statue of Lord Shiva is kept. Water sprinkling from Lord Shiva's head symbolises the holy river Ganga flowing out of Lord Shiva's locks and called Gangavatharana. Punyakoti Vana is a small park is inside the temple premises, attracting children. Newly inaugurated Hunuman Mukha Mantapa is another attraction at the temple. The 26 feet high structure, supported by 12 pillars has intricate carvings done in Chola Style. 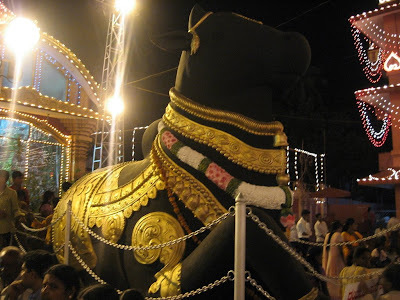 Also large Nandi statue facing the gopura of the temple, Geethopadesha statue catch the visitors attention. Next day was the last day of the celebrations i.e. 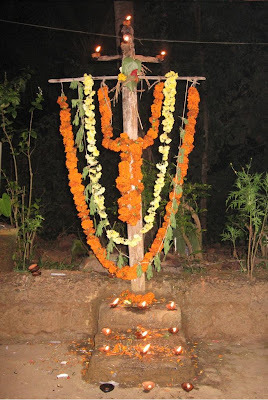 Vijayadashami. Dasara procession was carried out with several tableaux displaying mythological themes taking part. 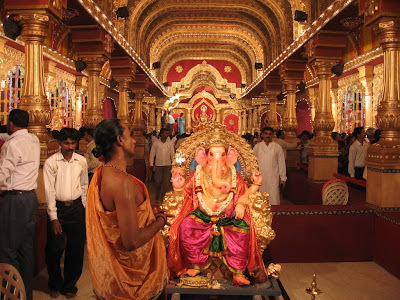 Idols of Navadurgis, Goddess Saraswathi and Lord Ganapathi were then immersed in the temple pond after the procession across the city. About 3 lakh people said to have witnessed the Mangalore Dasara procession. 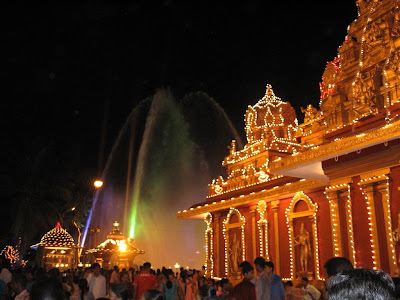 Navarathri is the best time to visit the temple if you are in Mangalore. 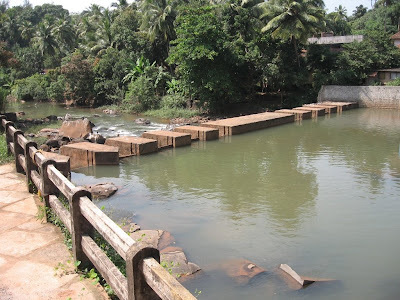 It has become one of the major tourist attractions in Mangalore. 2 years ago, in 2006, it was first time, I had heard of Aravind Adiga. Back then, he had written an article about Mangalore in TIME magazine, on how Mangalore as a city is growing up and had made whole of Mangalore proud. I kept on saying about this article in an international magazine to my friends and had written a post on it then. 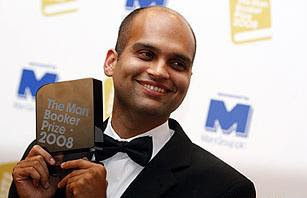 Aravind Adiga, a native of Mangalore, had done his schooling in St.Aloysius High School, Mangalore, one of the premier educational institutions in Mangalore. This year, when he was nominated for Booker prize, I sincerely hoped he wins it. Well, he has won the Booker prize and made whole of India proud. Congratulations Mr.Aravind Adiga. I keep getting enquiries from my friends about the release date of the film 'Psycho', more so because of the caller tunes I set of the 'Psycho' film songs. 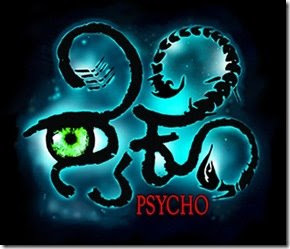 Well folks, here is some update on that - 'Psycho', most awaited Kannada movie in the second half of 2008 is set to hit cinema houses on 31st October 2008, if we go by the ads published in leading Kannada news paper, Udayavani. This movie has been in news for quite some time now - for not revealing who plays lead characters in the movie and for the amazing music composed by Raghu Dixit, giving rise to new genre of music in Kannada. Well, it is also said that it will be the world premier of the movie on 31st October 2008, as movie is set to release overseas, in UK and other European nations, Hong kong, Singapore, Malaysia, UAE, Australia, New Zealand and of course USA. Film is directed by V Devdatta, new face in Gandhinagar. Other than that, Hello, hindi film based on Chetan Bhagat's best selling novel, One Night @ the call center, is set to release this week on 10th October 2008. 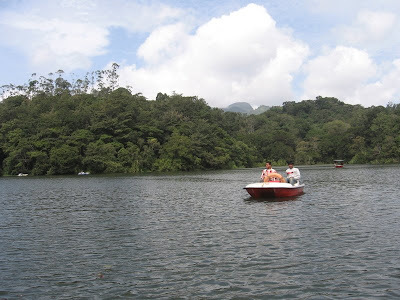 On Saturday 20th Septmber, we began our journey to Wayanad. 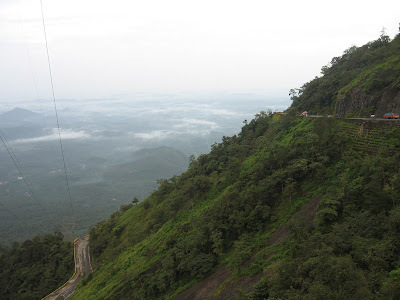 We were four of us, me, Jayasimha, Shrinidhi and Raviraj were on our way to Wayanad, popular tourist destination in Kerala and is about 282 kms from Bangalore. Journey began from Vijayanagar at 6 30 am in the morning with Nidhi in driver's seat in Scorpio, rented for self drive. New Animal in Bandipur National Park! 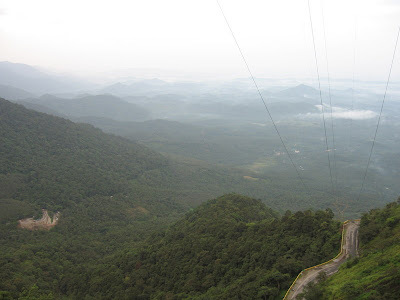 Route we followed was - Bangalore - Mysore - Gundlpete - Bandipur forest - Wayanad. 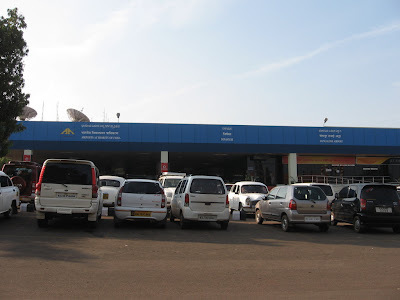 Bangalore - Mysore road is at its best inviting you to advance your speedometers. 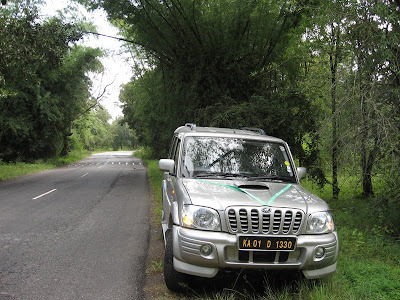 So is the NH212 route from Mysore to Kozhikode which passes via Bandipur national park. 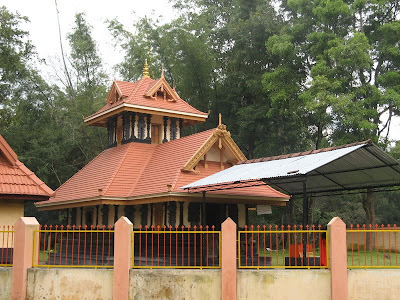 Soon after crossing Kerala border, we saw this Seetha Devi Temple at Ponkuzhi, reminiscent of Kerala temple architecture. After taking some snaps of the beautiful temple we cotinued on our journey, to reach Sultan Bathery at 11 30 am. Suthan Bathery as the name suggested, we thought it may be a fort like structure, where ammunitions used to be kept. But even after asking several locals, we could not locate the fort at the place. Then one wise guy pointed us to the Jain temple where the shells where kept then. Jain temple, built in 13th century was used by Tipu Sultan for keeping arms and ammunitions, after he captured the temple in 18th century. Hence the name, Suthan Bathery. 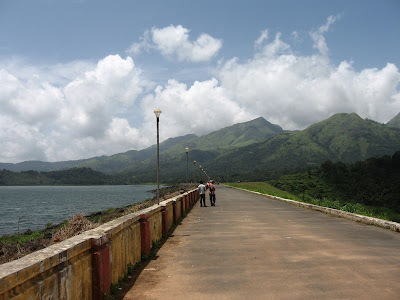 It is also the largest town in Wayanad district. Edakal caves was our next stop. We reached there around 12. You have to park your vehicle some distance before the place. To reach the caves on top, you can avail the jeep facility. It is a rocky hill, on the way to its top you will find 2 large caves. 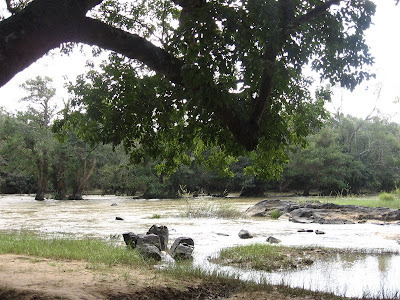 Edakal caves is also the place where the Kannada movie 'Edakallu Guddada Mele' directed by legendary director Puttanna Kanagal was shot, to be precise in the first cave. Incidentally that was the only film shot here as per the guide who briefed us about the history of these caves. Reaching the peak can be a adventurous task as there are some steep rocks to climb on the way. One has to go via the first cave to get to the top but second cave is not directly on the way. We visited the first cave and were on our way to the top keeping the programme of visiting the second cave postponed while getting down. The place was crowded with youngsters enjoying the nice weekend. we visited the second cave where you can find inscriptions on the rocks by stone age people who believed to have lived there. The whole process of climbing up the hill and getting down took us about 3 hours. 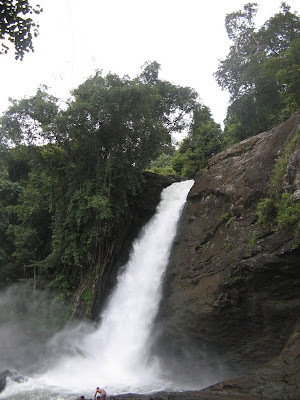 We continued our journey towards Soochipara falls after finishing lunch at Edakal at around 4. Since the places were within a distance of 10-20 kms travelling time was far less and we were near Soochipara falls soon after Edakal. 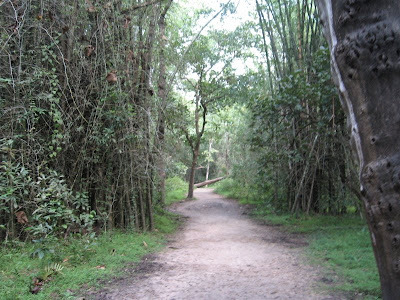 On our way to Soochipara falls we visited the Wayanad Heritage museum, did not find it interesting though. 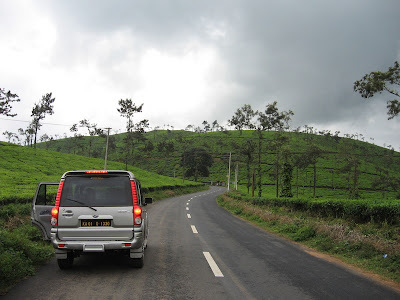 That apart, lush greenery of the tea plantations on the way is a treat to watch. 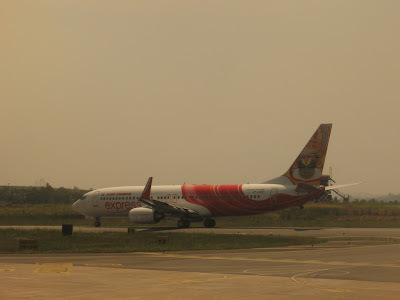 Also, they make perfect locations to take some great snaps of unforgettable journeys. 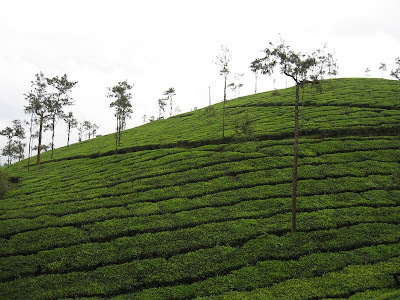 This also reminded me of how as children, we were mesmerized by the sight of all green tea plantations shown in Kannan Devan Tea ads! Now I was seeing them for real. 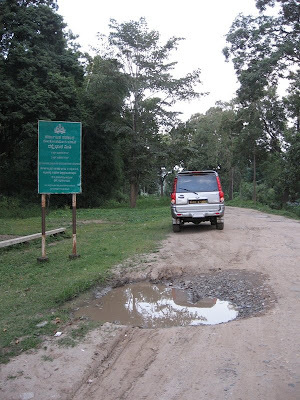 After parking the vehicle, way to Soochipara falls is about 2km walk. 200 meters Soochipara falls was already filled with people. Water falling from such height and great force had made surroundings filled with sound and had created misty surroundings. After Soochipara falls visit, we headed towards Kalpetta some 22 kms from Soochipara falls, in search of some good hotel to stay on that night. 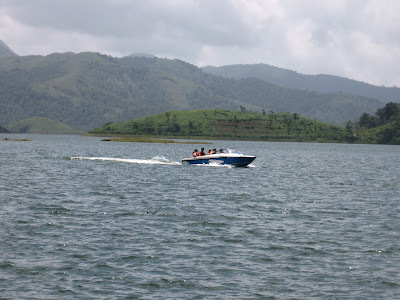 Kalpetta is the district headquarters of Wayanad, and hosts quite a number of hotels. After finding one to stay, we soon got into sleep, after discussing the next day morning's programme of visiting Lakkidi, a view point to catch the glimpse of misty mountains. Well, thats all folks for now. 2nd part of the trip coming soon. Few films leave their mark in the sands of time and 'A Wednesday' is one of them. A gripping story and top class performances by two senior actors in bollywood. No hero but the film is still a winner. Neeraj Pandey's directoral venture keeps you glued to your seats for about 1 hour 45 minutes. A Wednesday is the story of a common man who is fed up of frequent terror attacks and wants to get rid of the evil in his own way and also wants to send a clear message to the bureaucratic system in the country. Anupam Kher delivers his best as Prakash Rathod, Police Commissioner of Mumbai and so does Naseeruddin Shah as the anonymous caller who calls him. Naseeruddin Shah represents millions of our country men who as common men, have to bear the consequences of terrorist attacks. Angst of common man against the system which takes more than a decade to punish the culprits behind bomb blasts represents the current scenario in India. Film depicts all the situations which surrounds a bomb blast - how easily one places the bomb in the police headquarters, how the news hungry media exploits the situation when terrorist sends them the message of possible attack and in turn helps the terrorists to see the aftermath of their actions live on tv, how a redtape bureaucratic system like ours fails protect its own citizens in the time of need, how easily one makes judgements about a person knowing his religion and the list goes on. Neeraj has also handled the sensitive issue of religion well as seen from the fact that even at the end of the film, anonymous caller does not reveal his name or identity as people draw conclusions about his actions based upon his name which reveals his religion. Script has been handled well and there is never a dull moment in a thriller of a movie. New story line and its connection to the real world, impresses and provokes thought at the same time. Jimmy Shergil has donned the rough and tough role as inspector Arif khan, something new for him. Tamasha news aired nowadays by '24 hour news channels' and the telemarketing call by a credit card company to Prakash Rathod in middle of a crisis may make brief comic reliefs in an otherwise serious movie. In the end the only words I can say here are - 'this film is a must watch for all'.